From Totopotomy Creek continue down Route 606 for approximately one mile to its intersection with Route 634. This is Linney's Corner. Where Captain Latane was killed. ... On, on dashed Robins [ Ninth Virginia Cavalry adjutant Lieutenant Robins ], here skirting a field, there leaping a fence or ditch, and clearing the woods beyond, when not far from Old Church the enemy made a stand, having been re-enforced. The only mode of attack being in column of fours along the road, I still preferred to oppose the enemy with one squadron at a time, remembering that he who brings on the field the last cavalry reserve wins the day. The next squadron therefore moved to the front under the lamented Captain Latane, making a most brilliant and successful charge with drawn sabers upon the picketed ground, and, after a hotly-contested hand-to-hand conflict, put him to flight, but not till the gallant captain had sealed his devotion to his native soil with his blood. The enemy's rout (two squadrons by one of ours) was complete; they dispersed in terror and confusion, leaving many dead on the field and blood in quantities in their tracks. Their commander, Captain Royall, was reported mortally wounded . Several officers and a number of privates were taken in this conflict, and a number of horses, arms, and equipments, together with five guidons. The woods and fields were full of the scattered and disorganized foe straggling to and fro, and but for the delay and the great incumbrance which they would have been to our march, many more could and would have been captured. Burial of Latane by W.D. Washington ; engraved by A.G. Campbell. Engraving after a painting by William Dickinson Washington shows the funeral of William D. Latan�, a cavalry captain who was the only Confederate killed during J.E.B. Stuart's raid around the Union army near Richmond, Virginia on June 13, 1862. The funeral on Summer Hill Plantation is attended entirely by women, slaves and children. Mrs. Willoughby Newton performs the burial service in the center while her sister, Mrs. William Brockenbrough stands with other women and girls to the right. Slaves stand to the left. 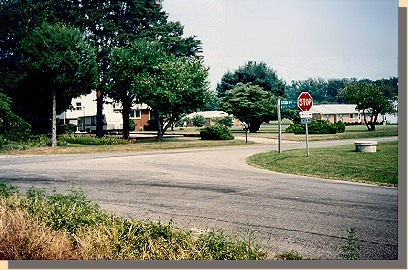 left, to Tunstall's Station, lower middle. Continuing down Route 606, we cross Route 360 at the stop lights. About a mile and one-half past Route 360 we come to an intersection marked "Old Church". When Stuart arrived here, he had to decide whether to continue riding around McClellan or return to Lee. He had already obtained the information Lee requested. ... Here was the turning point of the expedition. 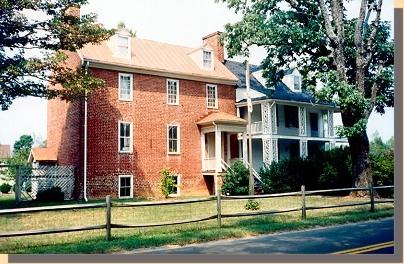 Two routes were before me - the one to return by Hanover Court-House, the other to pass around through New Kent, taking the chances of having to swim the Chickahominy and make a bold effort to cut the enemy's lines of communication. 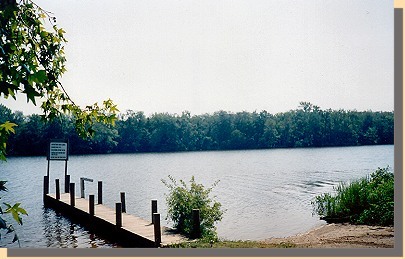 The Chickahominy was believed by my guide to be fordable near Forge Bridge. I was 14 miles from Hanover Court-House, which I would have to pass. If I returned, the enemy had a much shorter distance to pass to intercept me there; besides, the South Anna was impassable, which still further narrowed the chances of escape in that direction; the enemy, too, would naturally expect me to take that route. These circumstances led me to look with more favor to my favorite scheme, disclosed to you before starting, of passing around. It was only 9 miles to Tunstall's Station, on the York River Railroad, and that point once passed I felt little apprehension beyond. The route was one of all others which I felt sure the enemy would never expect me to take. On that side of the Chickahominy infantry could not reach me before crossing, and I felt able to whip any cavalry force that could be brought against me. Once on the Charles City side, I knew you would, when aware of my position, if necessary, order a diversion in my favor on the Charles City road, to prevent a move to intercept me from the direction of White Oak Swamp. Besides this, the hope of striking a serious blow at a boastful and insolent foe, which would make him tremble in his shoes, made more agreeable the alternative I chose. In a brief and frank interview with some of my officers I disclosed my views, but while none accorded a full assent, all assured me a hearty support in whatever I did. 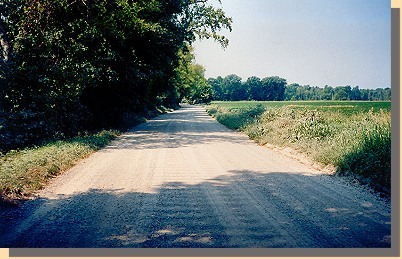 Continuing on Route 606, Old Church Road, after about eight miles we turn left onto Route 607, Steel Trap Road, a dirt and gravel road. About a mile down Route 607, (which, at times, appears to be a lane in somebody's back yard and is also marked with an "End State Maintenance" road sign) we turn right and down a hill into the Garlick's Landing parking lot. ... There was something of the sublime in the implicit confidence and unquestioning trust of the rank and file in a leader guiding them straight, apparently, into the very jaws of the enemy, every step appearing to them to diminish the faintest hope of extrication. Reports of the enemy's strength at Garlick's and Tunstall's were conflicting, but generally indicated a small number. Prisoners were captured at every step, and including officers, soldiers, and negroes.